Here is your chance to meet Big Ben next Tuesday, July 2nd in London! The Meet & Greet will take place at The Grosvenor House Hotel in London’s Park Lane at 7:00 p.m.
Ben will be the special guest at the first in a new and occasional style of NFLUK fan forum. An exclusive group of 30 fans – who on this occasion must be members of the Union Jax – will have the opportunity to spend time with Big Ben, discussing his NFL career, how he feels about playing in London, and even see him describe and diagram the construction of a Super Bowl-winning touchdown. But the short deadline to sign up for this event is THIS Thursday, June 27th! For more info and to apply for a spot at this exclusive event, click here. 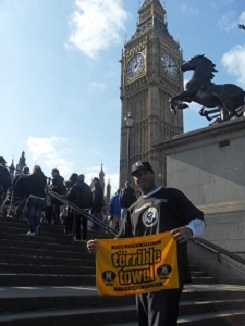 *That’s Shawn Stewart above, proud member of the Steel City Mafia posing in front of the “other” Big Ben!